I grew up drinking tea. Morning tea was a staple in my household even when the weather forecast was 100ºF. Breakfast always included a cup of tea with bread or pastry on the side. I bet you can call me a tea lover! Life is like a cup of tea. It’s all in how you make it. When your day seems topsy turvy and as stormy as can be, there’s nothing quite as tranquil as a nice hot cup of tea. This post is a roundup of 20 perfect gift ideas for tea lovers. From tea samplers and accessories to utensils and clothing. I love these items and I’m sure your tea-loving friends would be ecstatic to receive any one of these as a gift. 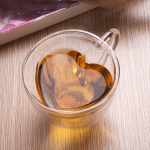 Heart-Shaped Tea Cup – Totally obsessed with this heart-shaped teacup. Your tea lover friends would swoon over this teacup. This glassware is super unique and practical. Mug Warmer – This tea lover will never have a cold tea again! This mug warmer comes with a convenient on/off switch and is lightweight for convenient transportation. Perfect for coffee lovers too! Safe to use at home or at the office. Stamped Tea Spoon – Gotta love this inscribed spoon for tea lovers. 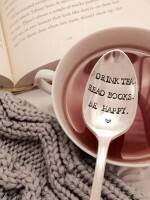 Drink tea, read books, be happy stamped spoon would make a perfect unique teaspoon. Tea from Around the World Set – This set of ten, single-estate teas lets you sample exotic varieties from around the world. Your passport is this international set of ten, single-estate, loose leaf teas. The set comes with 10 tubes of tea, as well as an informative book full of background information and brewing tips. Bring Me A Cup of Tea Socks – These socks are sure to bring someone a smile. 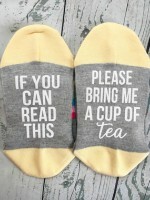 If you can read this bring me a cup of tea personalized socks! Great gift for the one you love or buy these for yourself socks! 1,000-Piece Teapots Puzzle – Tea lovers will salivate at this gorgeous collection of teapots. These strong high-quality puzzle pieces are made from recycled board that will delight and educate all at the same time. Matcha Green Tea Set – Enjoy the healthy practice and tradition of the tea ceremony and bring a bit of the ancient Japanese culture and healthy practice to your life with this matcha making set. It includes everything you need to enjoy an everyday matcha moment. 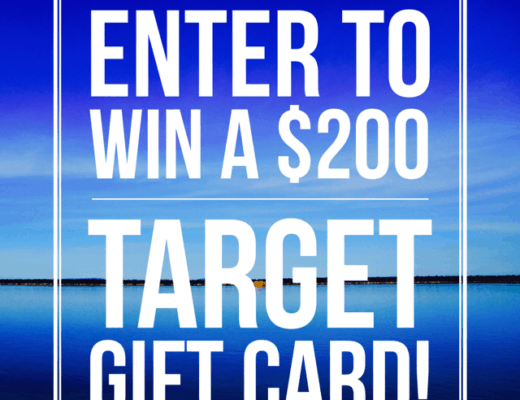 It makes a thoughtful gift for any foodie or mindfulness maven. A Tea Lover’s Book Box Gift Set – No other fun way to enjoy the day or weekend than with a beautiful book box. It comes complete with an assortment of classic favorites and exciting flavor profiles from around the world—all encased in a beautiful book box. 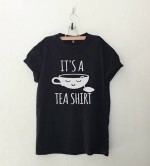 It’s tea shirt t-shirt – What a fun graphic shirt for tea lovers. He/She would wear this funny shirt with pride. The rolled up sleeves add some flare to the tea shirt. Hidden Animal Mugs – Just your cup of tea. Those obsessed with tea can keep tea parties full of surprises with these roomy ceramic mugs sculpted with owl, fox and bear figurines inside each cup. Drink up to reveal your hidden animal! 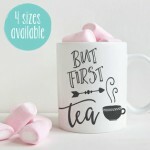 But First Tea Mug – This gorgeous porcelain mug makes the perfect gift for you and other tea lovers around you. Coworkers and employees will appreciate this funny mug. Organic Tea Infuser Gift Box – Now you can satisfy the most ardent tea lovers with this one of a kind whole leaf tea starter kit. It comes complete with a handmade tea infuser presented in an eco-friendly tea gift box. Stainless Steel Tea Bag Squeezer – A perfect gift for yourself or the tea lover in your life. Simply grasp the tea bag with the tongs and squeeze. No drips, no mess. Get more out of your tea bag with this tea bag squeezer. 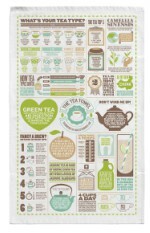 The Tea Towel – Learn a bit about your favorite brew with this charming info-graphic tea towel. Learn this and other well-steeped knowledge with this charming tea towel. Made of crisp organic cotton, this accessory showcases a vibrant infographic with information on tea types, history, and more. Tea Forté Assorted Variety Tea Sampler Box – Prepare the perfect cup of hot tea anywhere with this Kosher tea sampler with five varieties of single steeps. Solar Tea Lights – Let the sun shine with these colorful, swirled glow after dark glass lamps. These solar-powered LED bulbs provide an ambient glow that is long-lasting and energy-efficient. Silicone Reusable Tea Infuser Strainer Set – How thoughtful are these tea strainers? Say goodbye to disposable tea bag and enjoy these heat resistant (up to 480F) tea infusers. Tea lovers will enjoy a wonderful tea time with these bags that are perfect for every moment. Tea Timer – Take the guesswork out of tea steeping and tip over this elegant and easy-to-use timer instead. Unlike a typical hourglass, the jade-hued fluid inside flows from the bottom up, echoing the contents of your cup. Stainless Steel Temperature Control Electric Kettle – This kettle makes it easy to enjoy a vast variety of tea and coffee. A 2-hour keep warm button lets you tell the kettle to maintain a selected temperature for up to 2 hours. Tea wallet Travel Tea Bag Holder – This black and white, French theme tea wallet will bring a smile to the tea lovers in your life. Now they will have a special way to keep their favorite teas organized while on the go. A must-have accessory for the tea-lover. This rounds up our list of the most unique and thoughtful 20 perfect gift ideas for tea lovers. Your tea-loving friends and family will be stoked by your gift choices. If you’re obsessed with tea like I am, you can share this gift guide with your friends as a subtle hint of what kind of gifts you’d like and appreciate. Life is too short for bad tea ☕️. OMG Aileen! Masala tea sounds heavenly. Yes, I already have some of these gift ideas in my shopping bag lol. Oh these are great ideas and so helpful for my Christmas shopping. I have lots of friends and family members who love tea (as do I!). Those socks and that heart mug are going to the top of the list. I also grew up drinking tea. The first cup I had was with my tea set and my Scottish babysitter, bless her soul, poured me a cup and I drank it and enjoyed it. As I write this post, I have a tea on my bedside. This Christmas I asked for a teapot for when friends come over I am able to make a large pot rather than individual cups and having to steep each one individually. This is a great list!! I would love if someone would get me any one of these items! I have some many friends that are addicted to tea, these gifts are perfect for them (and me). I love the socks and also the warmer. Pretty much any of the gifts would be perfect. 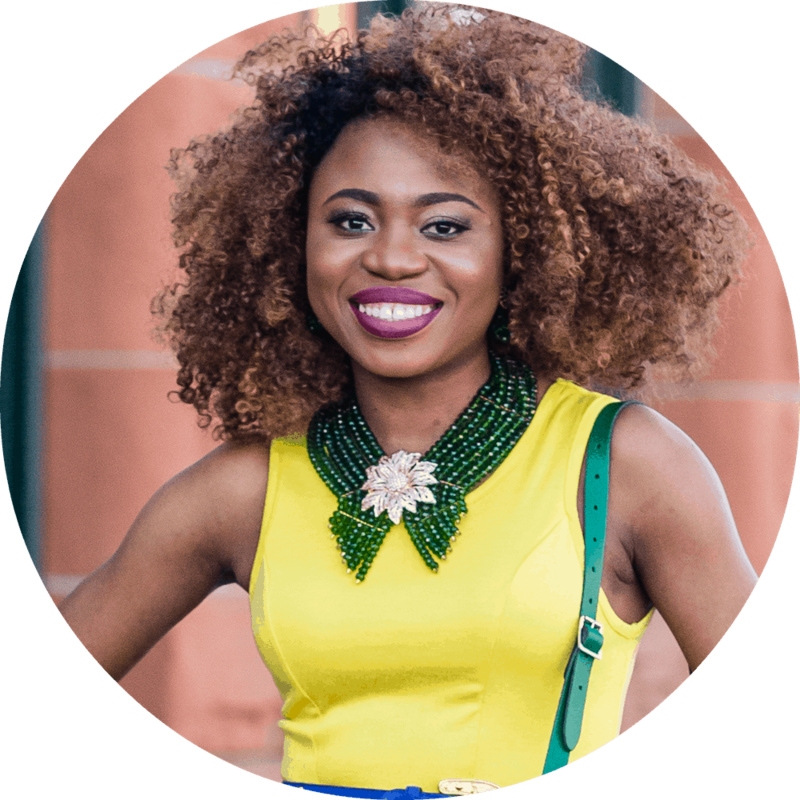 They are also affordable so you can buy for several of your friends. I am going to pick one for each friend and add their favorite tea flavor as their holiday gifts this year. Great ideas. What a great list of suggestions. I would probably like to have anything on it. I have always wanted a mug warmer. You won’t believe it but I was just on my favorite tea site ordering loose leaf tea before I came here!! I love the electric kettle and all the gifts you listed! 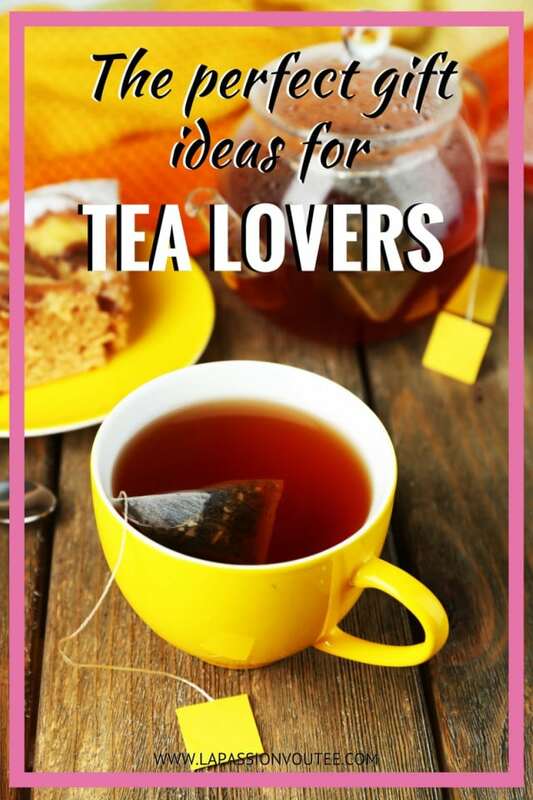 Wonderful ideas for any tea lover. That towel is so cute too! Hahaha glad you found some unique gifts for any tea lover. 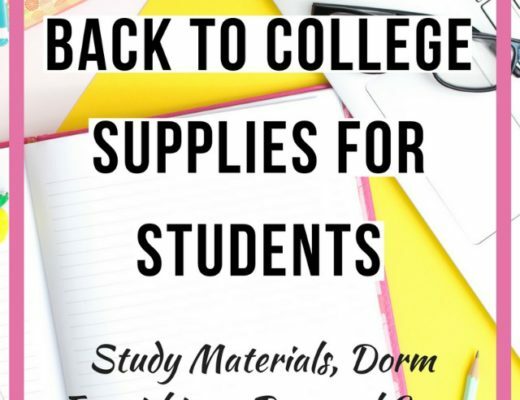 This is an awesome list that you have put together. While I know that they’d make great presents – I want them all for me too. They’re all super useful, especially the mug warmer ( even if this is the first time that I am hearing about it ). I know, right? I want it all and that tea warmer would come handy this time of the year. Oh you would love a visit to a Chinese tea shop for sure. I lived in Beijing in 2005 and there are a plethora of tea shops there. Just walking into the shops is heaven to the nose. The art of making a cup of tea is serious business in Asia. You have selected some really cute ideas for tea pals. I love the stamped spoons. As a tea drinker i would love to have the tea warmer!